The second annual Livable Cities Symposium highlighted the importance of interdisciplinary collaboration to define urban livability and outline best practices for bikeable, walkable cities with high quality of life. Photo by Mehmet Aktugan/Flickr. How can cities harness urban mobility solutions to become more livable? The second annual Livable Cities Symposium – co-hosted by EMBARQ Turkey and the İzmir Development Agency (İZKA) – addressed this question by gathering experts from Turkey and around the world, including mayors, academics, urban planners, engineers, entrepreneurs and civil society leaders, to share their perspectives on healthy, active, and livable cities. The Symposium created what EMBARQ Turkey Director Arzu Tekir described as a shared space to jointly define livability. 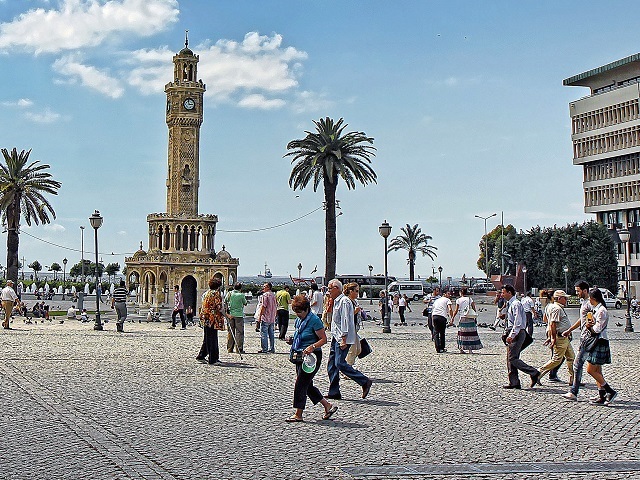 Building on last year’s Symposium that explored the role of transit-oriented development (TOD), this year’s Symposium took place on November 20, 2014 in İzmir – considered a model city in Turkey for its recent accomplishments in sustainable transport. With its special focus on bikeability and walkability, the Symposium highlighted the role of non-motorized transport for more livable cities, with sessions focusing on pedestrianization and urban cycling. Beyond non-motorized transport, panelists addressed a variety of systemic issues such as the governance of livable cities, the role of technology, integrated financing mechanisms for transport policies, and best practices from around the world. With 70% of the global population expected to live in cities by the year 2050, urbanization creates strong pressure for cities to provide livable solutions. 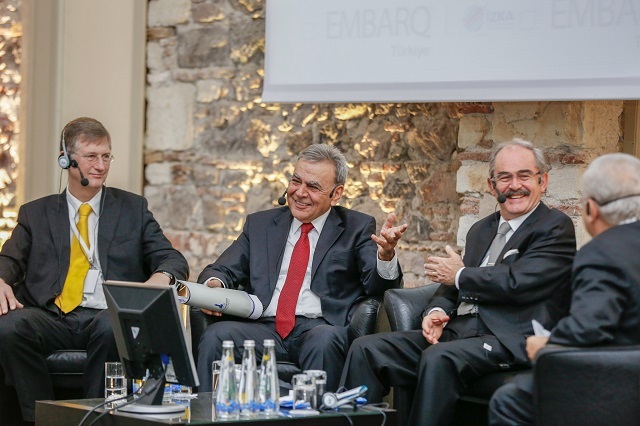 As EMBARQ Director Holger Dalkmann pointed out, this trend demands a paradigm shift in how we approach transport systems, for which disruptive ideas, political leadership, technical capacity, effective financing, and an entrepreneurial environment will be key. When implementing major urban interventions, however, the historic texture of cities should not be compromised. As Professor Pinar Mengüç, the Director of the Center for Energy, Environment, and Economy at Özyeğin University stated, the “continuity, soul, sense of place” makes each city unique. Thus, the future of planning faces the challenge of balancing disruptive, game changing solutions with the preservation of a city’s characteristic built environment. İzmir Mayor Kocaoğlu and Gustaf Landahl from the Department of Planning & Environment of the City of Stockholm emphasized the importance of a long-term vision in planning for livable cities. Mayor Kocaoğlu, for example, announced an ambitious plan to remediate of the Gulf of İzmir. Landahl mentioned that Stockholm was not always the model city it is now. Yet a guiding principle that the city has followed for decades has made Stockholm one of the most livable cities in the world: “smart solutions are compact solutions.” It is not surprising then, as Landahl highlighted in his presentation, that public transport currently accounts for about 80% of trips in Stockholm during peak hours, and that the city is on track to meet its goal of having 70% of fuels come from renewable sources by 2015. Gustaf Landahl from the City of Stockholm (left), Aziz Kocaoğlu, Mayor of İzmir Metropolitan Municipality (center), and Yılmaz Büyükerşen, Mayor of Eskişehir Metropolitan Municipality (right), discuss the role of governance for livable cities. While many livable city models were endorsed, certain challenges were repeated throughout the day, notably the need for life cycle costing in projects for the assessment of long-term impacts, as well as the problem of measurability. “You cannot govern what you cannot measure,” as one speaker appropriately said. An important takeaway from these panels was that despite the complexity and magnitude of urbanization problems, a collaborative scientific approach coupled with political will can result in “livable” cities like İzmir, Eskişehir and Stockholm. As markers of more connected, compact cities, biking and walking are considered core components of livability, and carry the benefits of improved road safety, reduced traffic congestion, and cleaner air. Professor Kevser Ustundag from Mimar Sinan University argued that in a country where 71.9% of the population is physically inactive, there is need for more “organic transport” – walking. “While focusing on facilitating the movement of cars, we forgot about accessibility,” she added. One kind of intervention that aims to reverse the rise of the private car is pedestrianization. Çiğdem Çörek Öztaş from EMBARQ Turkey and Sarika Panda from EMBARQ India discussed pedestrianization examples from Istanbul’s Historic Peninsula and Gurgaon, India, respectively. In the aftermath of the projects, both noted behavioral shifts in transport choices towards public transport and/or biking, as well as very positive feedback from local businesses surveyed. Representatives from bike-sharing schemes from İzmir and Koaceli in Turkey also described their recent success in attracting a considerable number of urbanites to bike. For cycling to be treated not just recreationally but also as a transport mode, however, safe cycle lanes and biking infrastructure are important prerequisites. Transport Engineer Tolga Imamoğlu from EMBARQ Turkey reiterated the importance of road safety audits and inspections, as simply encouraging more cycling with new bike-sharing schemes without safe cycle lanes has been shown to increase cyclist fatalities. Increased walking and biking point to behavioral shifts that have essential co-benefits ranging from physical and mental health to economic dynamism, making non-motorized transport indispensable for a livable city. Despite the challenges of rapid urbanization, what emerged from these sessions was that livable cities are those that have sustained economic dynamism and have overcome governance challenges, all the while creating a high-quality environment, safe streets and habitable social spaces. While it is surely not an easy task to meet all of these targets simultaneously, certain approaches to planning have shown that there can be synergies between seemingly contradictory goals. One example that was introduced as a best practice was the Swedish “Symbiocity” approach, which is “based on the idea of turning challenges into opportunities.” Symbiocity creates a framework of reviewing systems and planning processes that consider potential synergies between urban systems. Symbiosis, in this context, means “finding synergies between urban systems that save natural resources and cost less.” Uncovering synergies in urban systems is a promising new way to cultivate cities as democratic, economic, social and cultural powerhouses for more inclusive and sustainable development. Indeed, like Symbiocity, the Livable Cities Symposium was founded on the idea of interdisciplinary collaboration. A whole day of discussions on what makes a “livable” city showed that the challenges of urbanization will more likely be solved by a sophisticated understanding of our cities through functional frameworks, platforms or organizations that are able to bring together a diverse group and work together, just like a city.